We are opening up our free VPN to the general public – now available for download! Posted on September 7th, 2017 by ProtonVPN Admin in Articles & News. Back in June 2017, we launched ProtonVPN to provide a more secure VPN. Within 24 hours of launch, excessive demand meant we had to add a waiting list for our free VPN service. Today we’re happy to announce that free VPN signups are open again. Get your free ProtonVPN account by signing up here. Afterwards, you can download free VPN here. Today marks another important milestone in our mission to provide secure internet to the entire world. Now it is possible to get a free VPN account instantly without having to wait on a waiting list. In order to support this, we have been working hard over the past 3 months scaling ProtonVPN’s infrastructure. In the past month, over 100 servers were added to ProtonVPN’s global network, all connected to high bandwidth Gigabit connections. ProtonVPN was born from our mission to safeguard privacy in the digital age. After creating the world’s largest secure email provider, we’ve repeatedly witnessed the increasing infringement on user privacy on the Internet, and we built ProtonVPN in order to counteract this, and ensure that the Internet remains a force for freedom everywhere. While there are a number of free VPN providers in the market, ProtonVPN is the only free VPN service that is serious about user privacy. The vast majority of free VPN services available today actually provide the complete opposite of privacy because they are actually secretly selling user browsing data or connection for profit (Anchor Free, Hola, etc). Additionally, unlike other free VPN services (TunnelBear, Windscribe, Hide.me, etc. ), ProtonVPN’s free VPN service does not monitor user traffic or log traffic volume or session times, because we have no bandwidth limits or traffic caps. 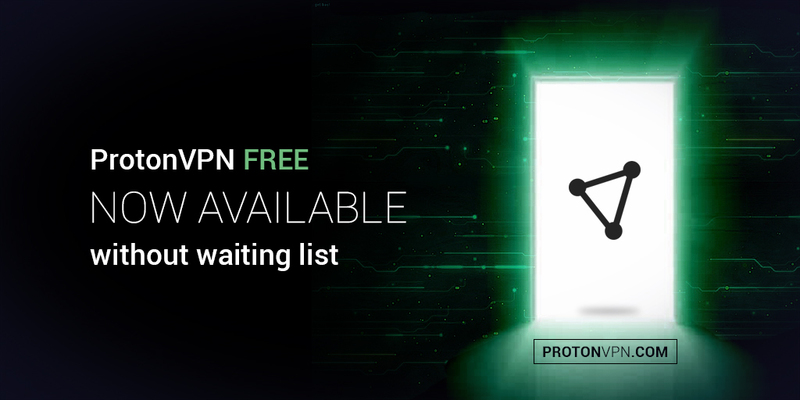 In other words, ProtonVPN is truly an unlimited free VPN service that has a strict no-logging policy, and comes with a long list of VPN security features. This unique combination of factors has made ProtonVPN’s free VPN service much more popular than we expected, which is why we were not able to meet the initial demand. Thanks to the continuous work from our server team, we have finally been able to add enough server capacity to now remove the waiting list and we look forward to providing VPN security to millions of people around the world. For those of you who wish to support ProtonVPN, purchasing a paid plan provides additional VPN security features such as our Secure Core network which adds an extra layer of protection against sophisticated network based attacks, and the ability to route traffic through the TOR network. ProtonVPN paid plans also come with much higher speeds, the ability to connect multiple devices at the same time, and support for P2P traffic. ProtonVPN is entirely funded by the support of paid subscribers, so by upgrading to a paid plan, you are also making it possible for us to provide secure internet to millions around the world who don’t have the means to pay for a VPN service. If you’re ready to take back your digital privacy, sign up here and then go here for your free VPN download now. Can I get the ProtonVPN Addon ,so it can be added to the google chrome browser ? Currently, we do not support HTTP/HTTPS proxy on our service, but that’s something we are considering to do in the future. Selling “Lifetime Visionary Account”s to user on waiting list will be great too. Not selling to waiting customers, are a risk to lost the customer every time. To get 1000€ onetime, is like to get 80€/year lifetime by 8% zins. How many years will one customer be a customer ? One year ? 10 years ? For rest of life ? Waiting for Lifetime Visionary Account, on waiting list. OpenVPN works fine with XP. All we need are the Proton configs .ovpn . Please do not abandon the less invasive versions of Windows. OpenVPN version 2.3.18 works fine on XP. All we need are the Proton config files .ovpn. Please do not abandon the less invasive versions of windows. I need my real IP fpr many applications I run on my PC, but want secure web browsing. So far I’m using Windscribe’s Firefox extension (others that advertise themselves a lot have unacceptable terms & conditions), but it’s a company based in Angloamerica (Canada, I believe), so I’d like to try your VPN, but, as I said, I want it only for my web browser. Do you plan to write a Firefox extension? This is not planned at this time, as we recommend people use our VPN application because this can protect not only your web browsing activity, but ALL of your internet traffic. If you are interested, I have a working solution (for windows). Involves using openvpn in service mode (running constantly) with custom config, local socks proxy (using 3proxy), and browser extension such as proxyswitchy omega for proxy switching. Requires a bit of networking knowledge, but nothing really difficult. PM me on facebook for details. Hi, I am getting this message almoste every second, is it anything serious I need to take care? Will this work with a Chromebook? I am trying the free mobile app. I also am trying the desktop app. Desktop app works great at all times. I will go on a paid plan next week. But the mobile app is very slow. Android 6.0.1 (all updates applied). Firefox browser. Tried purple.com and cnn.com. For apps I tried Fidelity and Follow My Health. For the apps: the apps never launched after a 5 minute wait each. The websites each failed on the first attempt (timed out). The second attempt took two to three minutes to load. I tried to locate any settings that might have an impact, but didn’t see any. Have s similar problem to Uber. But in my case, I registered long ago and my trial ran out long ago. Free service worked at first but like a week ago it just stopped doing anything. Even if server load reports to be 50%ish, I can’t open any webpage. For those folks saying their free service stopped working.. you are trying to access the paid servers most likely. They stop working after the “trial” period is over. however the “free” servers continue to work in my experience. You just need to connect to the free ones instead. hi, why do not use different port for example: 8080, 53, … for UDP and more? most VPN services use different port PIA VPN , AirVPN. I have request No. (26223), I have not received a reply yet. the best free vpn ever. I used to use VPNbook but now my ISP blocks it. I created an account and installed ProtonVPN just last week. During the free trial period of a paid plan the service worked well with acceptable speeds. My free trial ran out today and reverted to “free”. The service became instantly useless. I tried just pinging a website, http://www.yahoo.ca. Normal round trip ping time is about 30ms. After 1000 pings I had 0 replies. That’s 100% failure. Very disappointing. Hello! Is it confidential? Do not hand over your users if something goes wrong? You are securing this world to become a better place!